Gachon Herald roots for Pyeongchang 2018 Olympic Winter Games.Through an online quiz event, Gachon Herald reporters and Gachon University students pray for PyeongChang Winter Olympics, 2018. When? From 1 p.m. 3rd of August to 8 p.m. 13rd of August in 2017. Where? Front page of Gachon Herald’s Facebook account. What? Gave a quiz about sports in PyeongChang Winter Olympics, 2018. Why? 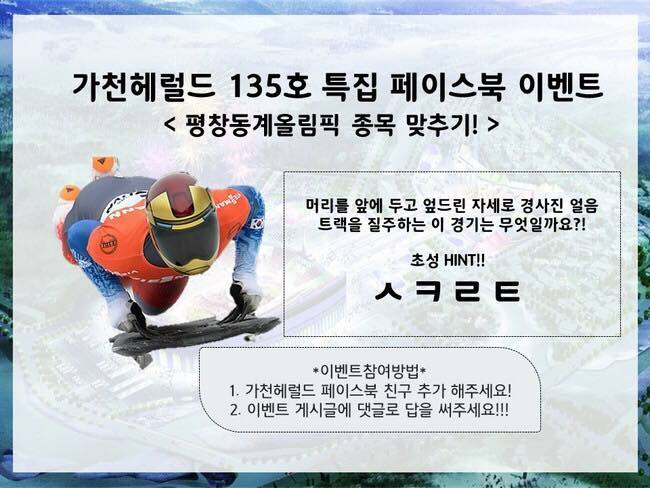 To know about PyeongChang Winter Olympics, 2018 and pray for it. How? Reporters posted quiz slides on Gachon Herald’s Facebook wall and they got students’ answers by comments. Reporters selected 20 prizewinners at the end of August. Unlike during the 134th edition’s event, many students participated. The fact that more than 100 students participated made us very happy. Since it was during the holiday season, we did an online event with the hope that we could make more students aware of the Gachon Herald. Also, I hope it was a wonderful time for both students and reporters to learn about the PyeongChang Winter Olympics, 2018.